HARP 3 chatters grows louder as Congress gets set to reconvene next week. On September 9, members of both the House of Representatives and the U.S. Senate report back to Capitol Hill. U.S. homeowners wonder if the HARP 2 program will finally get its upgrade. The HARP 3 program is currently waiting in committee. Click for today's HARP mortgage rates (Apr 20th, 2019). Has HARP 2 Finally Stalled Out? HARP 3 is the not-yet-available upgrade to the Home Affordable Refinance Program (HARP). HARP was initially passed in the winter of 2009 as part of that year’s economic stimulus. Sometimes called the “Obama Refi”, HARP gave U.S. homeowners whose homes had lost value the ability to refinance a loan that would otherwise be un-refinanceable. HARP carried just three qualifying hurdles. First, the homeowner’s mortgage had to be backed by either Fannie Mae or Freddie Mac with a securitization date on, or before, May 31, 2009. Second, the homeowner had to current on mortgage payments. And, third, the mortgage’s loan-to-value (LTV) could not exceed 125%. The government expected its HARP program to reach 7 million U.S. households. After two-plus years, though, it had failed to reach even one million. This is when the government chose to expand HARP’s reach via a rewrite. The new version was known as HARP 2. HARP 2 did a lot of the same things that HARP 1 did. It refinanced underwater mortgages; it provided low mortgage rates and fees; it gave a boost to the U.S. economy. However, it also removed some of the roadblocks which kept HARP 1 from reaching the government 7-million-home target. With HARP 2, Fannie Mae and Freddie Mac removed the 125% loan-to-value restriction. This immediately opened the program to severely underwater homeowners in places like California, Nevada, Florida and Arizona where some homes had lost more than half their value from the decade prior. HARP 2 also removed same-servicer requirements, which meant that U.S. homeowners could refinance with any HARP-participating lender — not just their current one. This was a big deal to people whose loans were serviced by firms such as Seterus and Cenlar — neither of which “originate” loans. Lastly, under HARP 2, Fannie Mae and Freddie Mac changed the “securitization date” limit of May 31, 2009 to a “note date” limit of May 31, 2009. This, too, rendered additional U.S. households HARP-eligible. Three times as many loans have closed under HARP 2 as HARP 1 and there are now 2.65 million closed HARP loans nationwide. However, the rate of closings is slowing. In May 2013, the fewest number of HARP loans closed than during any month this year. Furthermore, the number of loans with LTVs over 125% are slipping. As the housing market recovers, there is less need for ultra-high LTV loans. This is among the reasons why HARP 3 is getting such attention. In order to reach 7 million U.S. households, the Home Affordable Refinance Program may need another rewrite. HARP 2.0 is stalling. It’s a function of the housing market rebound, rising U.S. mortgage rates, and lack of program awareness. There are millions of HARP-eligible U.S. households simply unaware that the program even exists, for example. However, for other homeowners, there’s an acute awareness of what HARP 2 can do for a mortgage and, perhaps more importantly, what HARP 2 cannot do. Program restrictions have kept the Obama Refi from reaching its 7-million-household target. It’s possible that a third version of HARP — HARP 3 — could address them. And, today, in Congress, bills sit in committee in both the House and the Senate with the title “Responsible Homeowner Refinancing Act of 2013”. The House bill is H.R. 736 and has 19 co-sponsors. The Senate bill is S. 249 and has 23 co-sponsors. Both bills await passage into law. What Will Be Included In HARP 3? The Responsible Homeowner Refinancing Act of 2013 bill text defines specific changes to the Home Affordable Refinance Program including a leveling out of loan fees, the introduction of low-cost appraisal methods, and the elimination of employment and income verification, which is similar to how the FHA Streamline Refinance and the VA IRRRL programs work. It’s unlikely that the Responsible Homeowner Refinancing Act of 2013 will pass in its current form. Few bills do. When HARP 3 is made final, if it’s ever made final, it’s more likely to include at least one of the following program amendments — maybe even all of them. 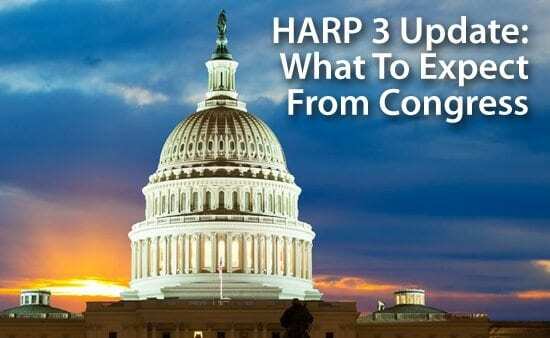 We won’t know what HARP 3 looks like until the program is released. Currently, the Home Affordable Refinance Program allows the refinance of mortgages backed Fannie Mae or Freddie Mac only. HARP 3 may expand the program to include loans held by private mortgage lenders including, but not limited to, Alt-A lenders, sub-prime lenders, jumbo mortgage lenders, credit unions and community banks, and mortgage servicers. All loans not backed by the FHA, VA, or USDA could potentially be HARP 3-eligible. HARP 3 is likely to resemble a streamlined refinance program, similar to the ones offered by the FHA and the VA. Streamlined refinances use mortgage payment history as a primary qualification tool. Other underwriting criteria including income verification, employment verification and credit score verification may be waived with HARP 3. This change would be of particular benefit to self-employed homeowners with a strong mortgage payment history. In order to qualify for the Home Affordable Refinance Program, your loan must have a note date no later than May 31, 2009. That’s more than four years ago. HARP 3 may include a eligibility date change, which would make homeowners whose loans began in 2010 and 2011 eligible to refinance. The current Home Affordable Refinance Guidelines state that eligible U.S. homeowners can use the HARP program once. This policy has raised a chorus of “that’s unfair” from homeowners who used HARP at its outset. In 2009, mortgage rates were in the 5 percent range. By 2013, they had dropped to the 3s. Homeowners who jumped on HARP in 2009 remain “locked out” today. The FHA allows homeowners to refinance after 6 payments have been made on a loan. HARP 3 may include a similar policy to allow the re-HARP of an existing HARP home loan. When Will HARP 3 Pass Congress? HARP 3 is full of promise for U.S. homeowners and for housing. It’s sitting in committee and could pass as soon as this week, or as late as never. One thing is certain, though — demand is strong and increasing each week. Take a look at today’s HARP mortgage rates and see what a refinance can do for your budget. Mortgage rates are available online for free and with no obligation whatsoever. Homeowners save big money with the Home Affordable Refinance Program — see what the program can do for you.